This was number one on the list. I made it for her family, then made the same exact thing (but with soy cheese and a different kind of beer) at my home 2 hours later. I’m PRETTY sure I remembered the recipe correctly from earlier in the evening. 1. Heat oil in skillet over medium heat. Add onions, garlic, jalapeno, cumin and some salt and pepper. Cook for about 5 minutes until onions are softened. 2. 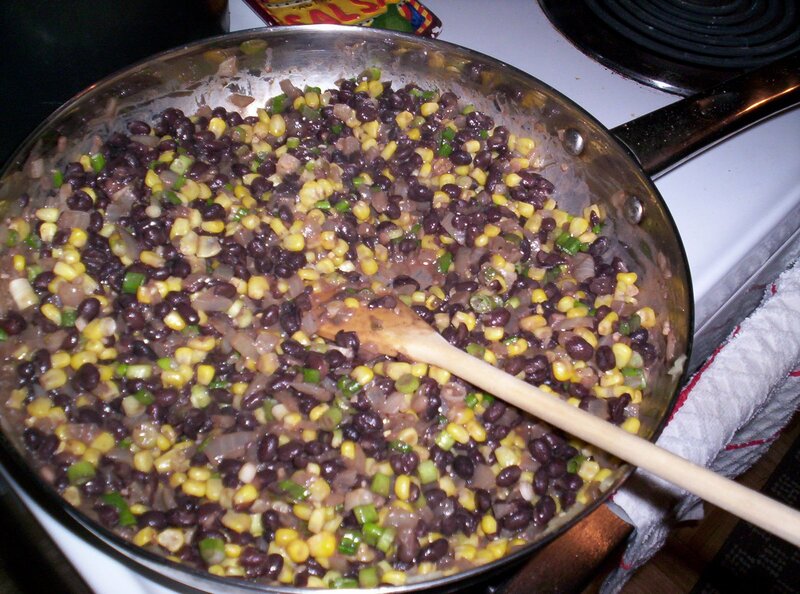 Add rinsed and drained black beans and beer. Turn up the heat and bring to a boil, then lower to med and cook for 8-10 minutes until liquid is reduced and there is almost none left. 4. Get ready to layer in a 9″ springform pan. Using the bottom of the pan as a guide, trim tortillas. 5. 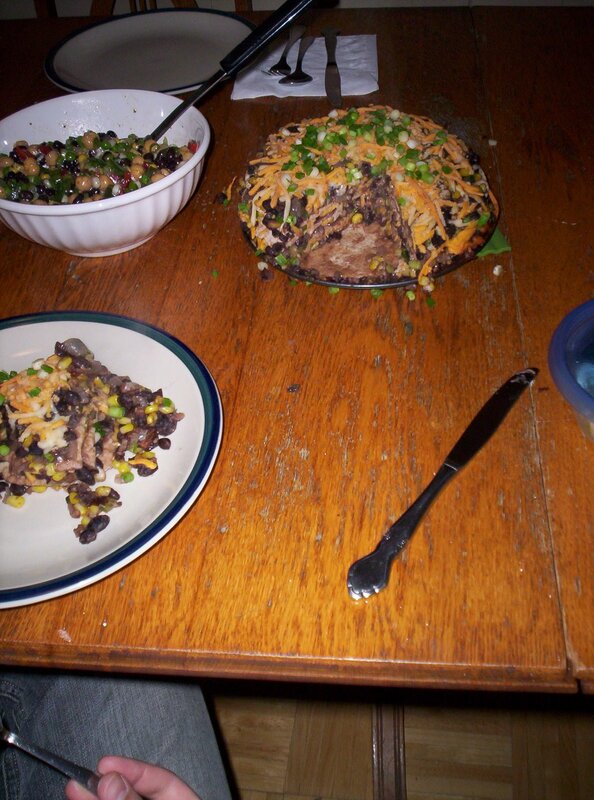 Place one tortilla in bottom of pan. 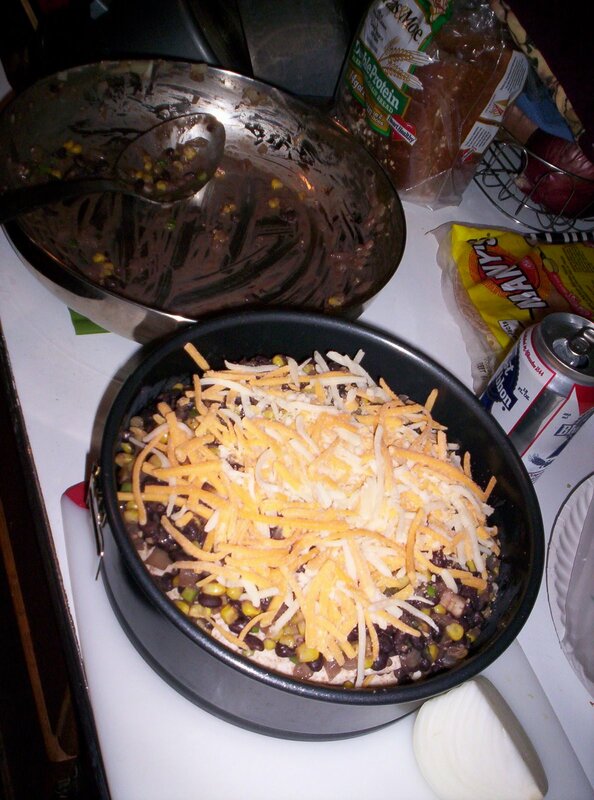 Put 1/4 of bean mixture 1/2 c. of cheese. Repeat 3 times. 6. 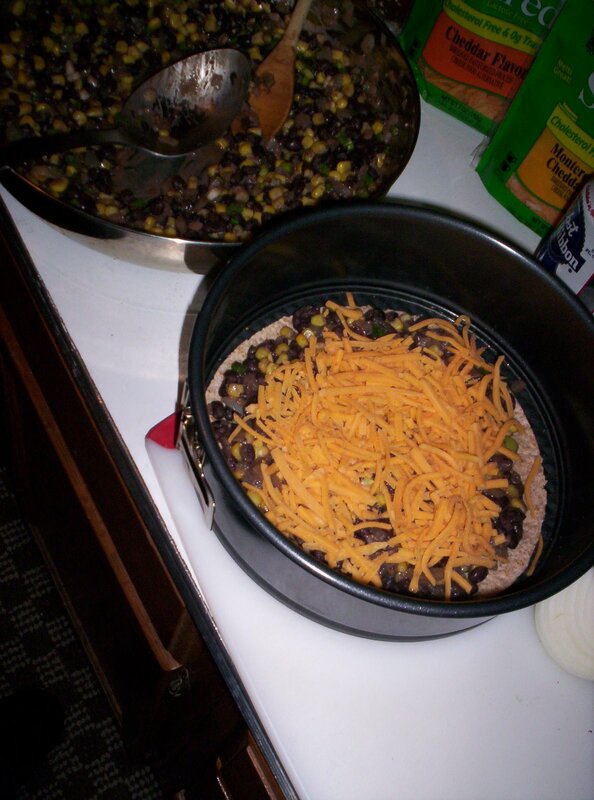 On top of fourth tortilla, place rest of bean mixture and 1 c. of cheese. 7. 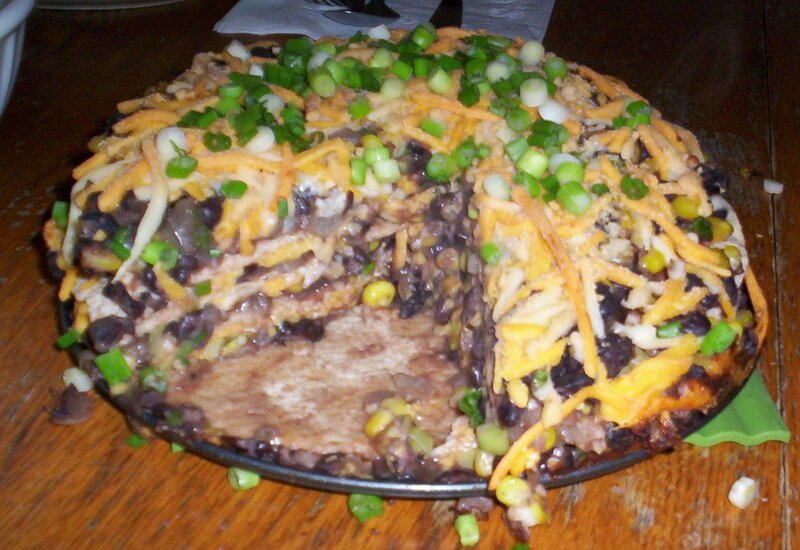 Bake for 20 to 25 minutes, until cheese is melted and everything is heated through. Top with remaining green onions for garnish. 8. Remove ring from springform pan. Cut wedge slices. I ate sour cream with some of mine. My squeeze chose without. 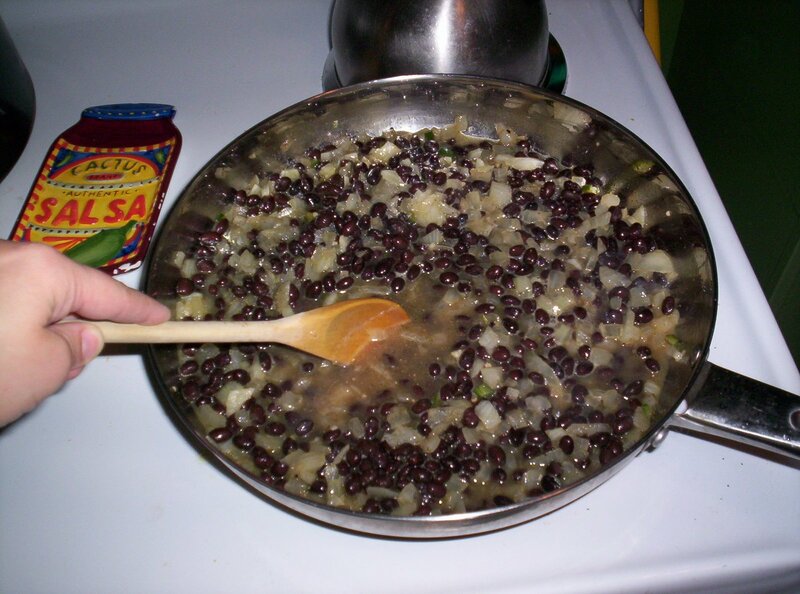 You could probably top with all kinds of stuff like salsa, guacamole, black olives or whatever you like! Amazing food… at a sports bar? I decided to go to the sports bar 24 Seconds. Originally, I had planned to go to my favorite pizza joint, Amici’s (More about them later. There’s so much I want to write about them, I haven’t had the time to give them the focus they deserve), but they weren’t open yet. So, I took Carrie’s word for it that a sports bar would have plenty of vegetarian options. When I walked inside, my ears immediately were assaulted by cranked up speakers blasting various sporting events. A bowl game here, a basketball game there. I don’t think I ever truly adjusted to it, and still don’t understand why it had to be THAT loud. But the other, sports-loving patrons seemed to be find with it, not to mention the 20 or so TVs that were plastered throughout the place. BUT, Carrie was right — lots of food to choose from. I ended up going with a side of the cucumber, onion, dill salad and a giant grilled vegetable salad for lunch. It had greens, pine nuts, Gorgonzola cheese, tons of grilled veggies including asparagus, mushrooms and tomatoes, and had a great citrus balsamic vinaigrette with it, and was served over toasted ciabatta bread points.